Outstanding Actor in a Drama Series. awesome to see the NAACP honor his work, too. 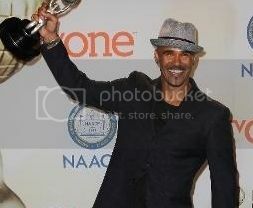 It is SHEMAR's 8th Image Award and the first for "Criminal Minds." on "The Young and the Restless." SHEMAR may need to build another shelf at his home for statuettes. guessing that this is only the beginning of the honors headed his way. Break a leg, Baby Boy! We know the best is yet to come.